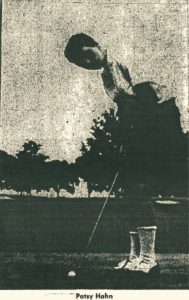 Moving forward to the 60s, Patsy Hahn, DuPont Country Club, was a 3-time titlist of the Delaware State Women’s Amateur Golf Champion, seeking her fourth title in 1960 at Hercules Country Club. Displaying the brilliant golf which characterized her play all through the tourney, Miss Hahn went to the front at the start and steadily increased her lead. In comparison, Mrs. Hazlett, who was playing in her first state event, failed to display the form which enabled her to oust her opponent. Patsy Hahn wrapped up the title on No.14, 6up on her opponent, Mrs. James B. Hazlett, Jr., DuPont Country Club. She needed only 28 putts through 14 holes, finishing with a 3-over-par, 59. 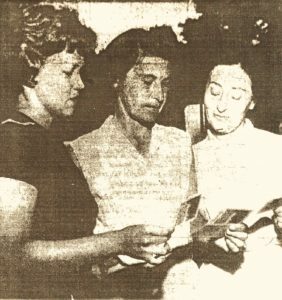 Mrs. E. J. Stegemeier (center), Rock Manor, compares cards with Mrs. Pat Hogue (left), Hercules, and Mrs. Lewis Harris, Brandywine, at the Delaware State Women’s Amateur Golf Tournament at Hercules Country Club. Patsy Hahn, DuPont Country Club, 4-Time Delaware Women’s Amateur Golf Championship. 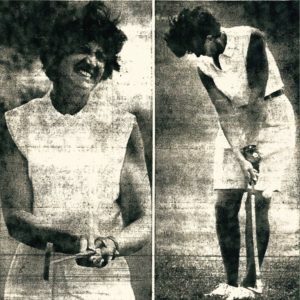 Then in 1966, a new queen of amateur golfers was crowned with her 5th golf title, winning the Delaware Women’s Amateur Golf Championship at Garrisons Lake. Betty Richardson, Rock Manor Golf Club, charged down the back nine to land her fifth Delaware Amateur Women’s Golf Championship and second in succession with a narrow 2 and 1 victory over Mrs. William W. Geddes of Wilmington Country Club. Ms. Richardson stated, “On the front nine, I was trying to play Mrs. Geddes instead of concentrating on the course. It took me until the last nine to get my mind on what I was doing. I just wasn’t thinking at all. Maybe I came in to the match a little over-confident.” That confidence came from her previous wins of the championship in 1954, 1955, 1960, and 1965. Betty Richardson grimaces in 1st photo on a missed putt, but then comes back and is aided by a great chip shot on the next hole. 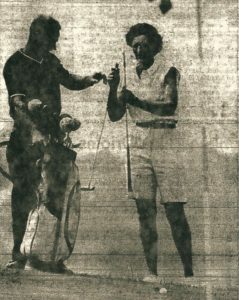 Betty Richardson shown selecting her putter from her bag held by her caddy Jim Watson.